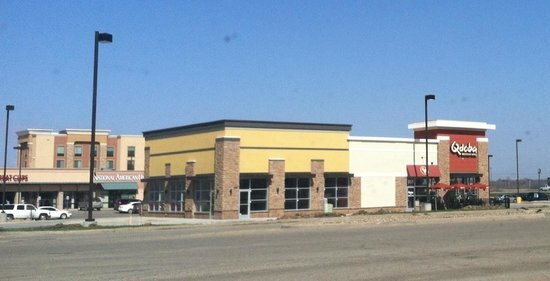 There aren't enough food, service, value or atmosphere ratings for Qdoba Mexican Grill, South Dakota yet. Be one of the first to write a review! I have had better experiences in other cities. If I am craving Mexican food, this is one of our top picks. The food is very filling and very delicious. The kids request this place often. Good place to eat and the portions can be very large but it is quite spendy. Go at a busy time or the food has been sitting for awhile and does not look appealing. My first visit to Qdoba in Watertown was pleasant. The location is handy just off 212 and close to I-29. The food was good and consistent with what I've had in Brookings, Aberdeen and Billings. The staff was excellent, very professional but friendly and knowledgeable. Consistent with other Qdoba's. Food was great and the place was clean. Staff efficient and friendly. A new addition to the area with a great name. They run specials, but parking is often difficult near Qdoba. There is additional parking in the Wal-Mart lot. Get quick answers from Qdoba Mexican Grill staff and past visitors.